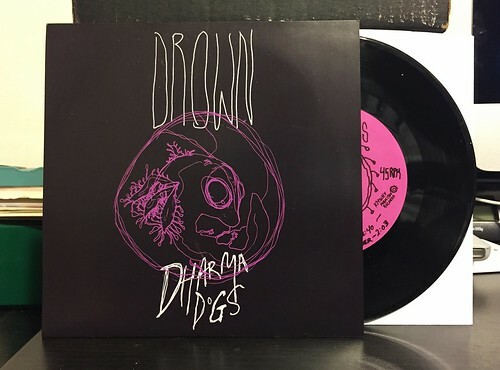 I Buy Way Too Many Records Dot Com: Dharma Dogs - Drown 7"
It's been really wacky to see the uptick in the number of records people are sending me to review. I'm not sure exactly why this started to happen all of a sudden. It's not a complaint, but I'm curious what changed to make people want to start sending me things. This 7" is a bit of a weird one. It's from 2012. I'm not sure why the person who sent it decided to send me a three year old record. Not that I'm against that or have any sort of rules about how recent a record is before sending it, but it's a little unusual to receive a record that's not a current, brand new record. Dharma Dogs is an odd little band. The three songs on this record are all somewhat dark and the band had managed to really wack out the guitar sound on the record. It's got a swampy, muddled tone that makes the songs tend to bleed into each other. On top of that there's some pretty angry sounding yelling and wailing by the main vocalist. I'm not really into this sort of thing. I typically need a bit more melody than Dharma Dogs are providing me on this record. For it's genre, I guess it's OK, but there's almost never going to be a time where I want to listen to this sort of music. It always comes across to me like a bunch of dudes yelling and presumably flailing around on stage during a live show and that's just not my thing. Oh and label folks, I'm probably not going to do a full review of that Tiny Daggers cassette. I didn't really like it and you probably know how I feel about tapes. We'll see, I'll hang on to it and maybe I'll get to it during a slow week.